MANITOGA, the House, Studio and 75-acre Woodland garden of mid-century designer Russel Wright (1904-1976), is a National Historic Landmark, an Affiliate Site of the National Trust for Historic Preservation, and a World Monuments Watch Site. It is one of the few 20th century modern homes open to the public in New York State. Located in Garrison, New York, approximately one hour north of New York City, Manitoga is the former home and 75-acre woodland garden of American industrial designer Russel Wright (1904-1976). 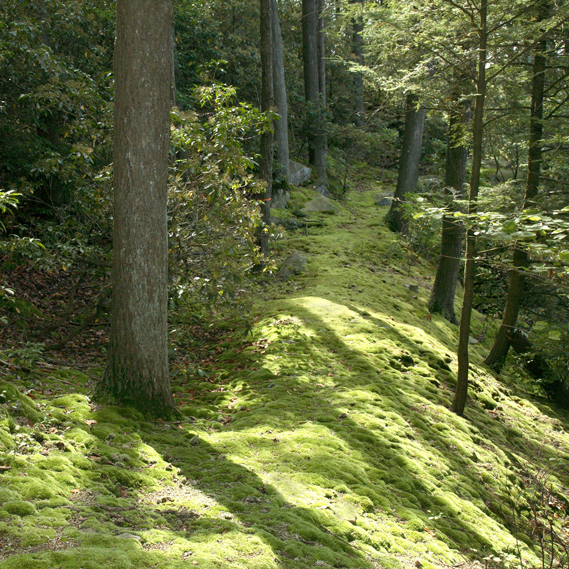 Manitoga is a National Historic Landmark, an Affiliate Site of the National Trust for Historic Preservation, and one of the few 20th century modern homes with original landscape open to the public. Manitoga's 2019 Tour Season is from May 10 to NOV 11. To view the House & Studio reservations are required. Tickets available now through BrownPaperTickets.com. Visit the Tours Page for details. After studying the site over many years, Russel Wright hired architect David Leavitt (1918-2013) to help him realize Dragon Rock, the name given to the House, Studio, and immediate quarry landscape. 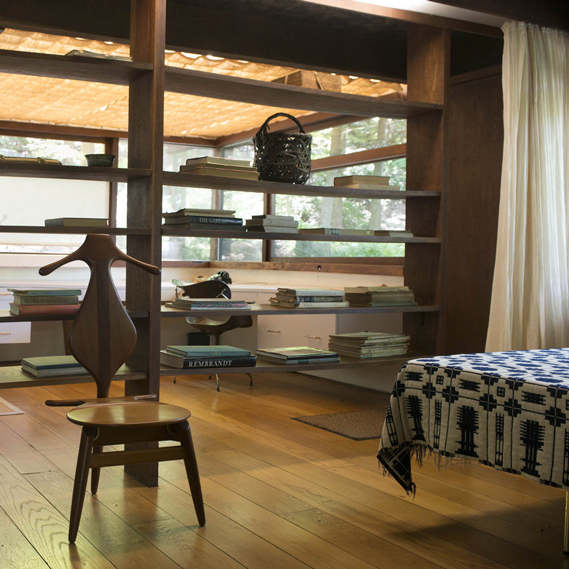 Leavitt, who had worked in Japan with architect Antonin Raymond, shared Wright’s appreciation of Japanese architecture and landscape design, evident in the House and Studio through scale, structure, intimacy, and details. Distinctive features of the House include large expanses of glass allowing for views of the 30 foot Waterfall, the Quarry Pool, and surrounding landscape. A large, smooth, cedar tree trunk functions as a design element and is the main structural support of house. Boulders, plantings, and stone terraces are positioned to bring the outdoors in, blending architecture and landscape. Unique built-in architectural artifacts, designed by Wright, fuse natural and man-made materials in new and unexpected ways. Here, we see luminous butterfly wings pressed between sheets of translucent plastic, pine needles embedded in green plaster walls, and a roof covered with a lush carpet of native plants. Wright intended Manitoga to be not only a home for himself but “an exaggerated demonstration of how individual a house can be.” He shaped Dragon Rock into a house of high drama, a theme evident from its approach -- a vine-draped wooden pergola separating the house and studio, seductively veiling the view of the Waterfall. Over the last decade, a series of restoration projects addressed the House windows and doors, and the installation of a new green roof, among other improvements. With the building envelope now restored, Manitoga is poised to begin work on much-anticipated interior restoration. The Studio was Russel Wright’s personal space where he slept and worked. It illustrates many of the recurring themes at Manitoga including an integration of the built and natural environment, the influence of Japanese design, the juxtaposition of natural and synthetic materials, and efficiency and functionality. Distinctive features include a “worm’s eye view” upon entering the space, pocket windows on three sides which, when lowered, meld the indoors with outdoors, and a moon-faced doorknob to the adjoining terrace where Wright would sit and look at the moon. Ceiling treatments are many and include painted epoxy embedded with white pine needles, fluorescent tubes softened by quilted canvas, and illuminated panels. The cedar-lined bathroom is inspired by Pullman train cars. A number of Wright designed furnishings are on view in the Studio including an early 1930s black lacquer lazy Susan coffee table and a bedside table manufactured by Statton that embodies Wright’s focus on easy functionality. From 2001 to 2004, the Studio underwent extensive restoration. It opened to the public in 2004 and includes Wright’s recreated white Formica desk, his Herman Miller “relax” chair, collectibles from his travels, an ashtray and a signature pack of Salem cigarettes. Over 70 years ago, Russel and Mary Wright acquired an abandoned quarry and surrounding hillside in the Lower Hudson Valley, and he slowly restored this land to a place of extraordinary beauty. Inspired by the legacy of the Wappinger people, the ancestral residents of the area, Wright called the emerging vision for these 75 acres “Manitoga” or Place of Great Spirit. In its concept, design, and management, Manitoga unites art, science, culture, and nature with an ecological aesthetic that is both human and spiritual. At a time when most Americans are profoundly alienated from nature and feel isolated from or sentimental toward the world they share with other living things, Manitoga can be seen as an important step in the evolution of our consciousness. At Manitoga, Wright took on a difficult task: to help the average person see and understand the subtle and seemingly chaotic world of the Northeastern deciduous forest. Instead of imposing rigid forms and preconceived patterns on his landscape, Wright sought to make contact with the fluid structure and connecting patterns of the natural world...he waited for the place to reveal itself to him and delighted in the complex order that unfolded over time. Although the many elements of the garden are familiar—house, terraces, parking lot, trellis, and paths—nothing is conventional. Wright’s integrating vision changed all the familiar components, blending the built elements and the natural landscape together so that each was enriched, enhanced, and transformed by the other. Just as the house is interwoven with the site, the hillside is connected by views to its larger context of the Hudson River Valley, and the visitors themselves are involved in an intimate and unfolding relationship to the place. For Wright, working on his garden was a process involving three activities. First, close observation over a number of years of a landscape he knew intimately and cared for deeply. Second, discovery and recognition of significant forms, patterns, and relationships. And third, clarification and dramatization of the element, so that its critical features stand out boldly enough to be perceived by the casual visitor. The orchestration of movement was another important technique used by Wright to move the visitor from the more passive role of observer into a more active role of participant. Manitoga is an interconnected whole where carefully crafted transitions carry the walker through the garden in a continuous movement which flows from place to place. Along each path, the landscape and its themes unfold sequentially. There is an introduction, a dramatic build-up, elaboration of a theme, and then a climax or goal; the building of tension and its dramatic release—the whole design a musical composition. In 2016, Open Space Institute and Manitoga worked in partnership to guarantee the protection the of the Russel Wright designed trail network at Manitoga. The agreement guarantees permanent public access to Manitoga’s scenic footpaths while protecting a key access point to the Appalachian Trail, through the adjacent Hudson Highlands State Park.